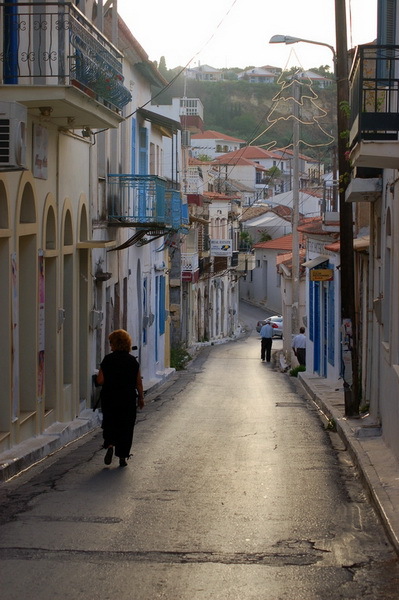 The gyftika, or Kakoskali, is the first, while entering the town, neighborhood of Koroni. On the left, the Messinian gulf, within an idyllic blue background, and on the right the 'Tourlakou' hill, the lucky eternal spectator onto its natural balcony. The narrow road is descending, bordered by old mansions and shops, and soon the visitor is wondering whether he should continue straight ahead or will he climb up the picturesque little stairs. Nevertheless, Koroni is openheartedly waiting for you as if you were to be honored. Stepping down the cobbled wide paved little stairs, with recently planted small trees you are brought to, just to the left, in front of the Karapavlos', the chieftain's, mansion. The St. Demetrios Metropolitan Church is fitting, a basilica of the Ionian islands' art, which was built in 1864. The clock is a donation of Moudakis in 1909.